The bank appears to have built an otherwise enviable business which is of interest to any suitor. The Axis Bank stock has underperformed the benchmark substantially in the past year, rising 3% versus a 12.8% increase in the Nifty. There has been plenty of talk around the stock: Rumours of being acquired by a rival, mounting pressure on asset quality culminating in asset quality divergence highlighted by RBI, a successful capital raising and, finally, the early exit of high-profile CEO Shikha Sharma. So the question arises, how should investors read these conflicting signals in the current volatile environment of Indian banking? Asset quality woes will linger on for a couple of more quarters especially after the February 12 RBI circular that closed the door on all existing categorisation of standard stressed assets. For large accounts with aggregate exposure of over Rs 2,000 crore, the failure to resolve within 180 days from March 1 would warrant taking the cases to the Insolvency and Bankruptcy Code (IBC) as well. 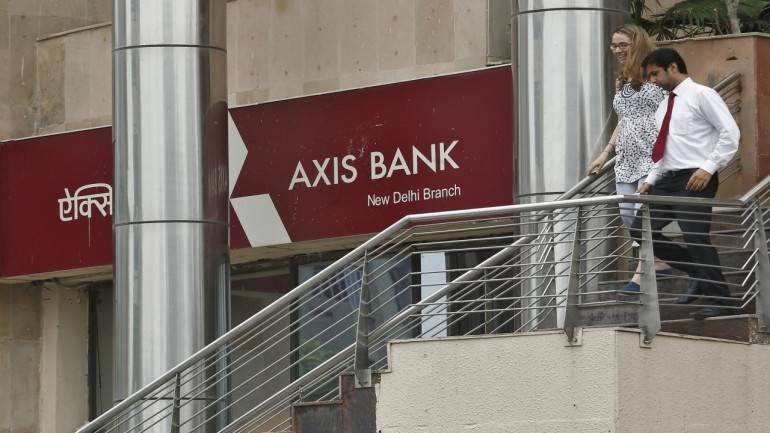 FY17 was a difficult year for Axis that saw its gross non performing assets (NPAs) rise from 1.67% to 5.04% with a gross slippage of Rs 21,781 crore. 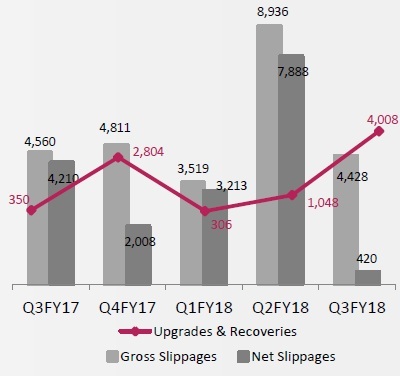 The moderation of slippage in the first quarter of FY18 was followed by gross slippage climbing in the second quarter thanks to the asset quality divergence pointed out by Reserve Bank of India (RBI). While gross and net NPA stood at 5.28% and 2.56%, respectively, at the end of December 2018, we feel the pain is not yet over. Since a large part of the slippage is coming from the lower rated (BB and below) assets, we focus on this pool and the outstanding assets that are either restructured or under various dispensation (like SDR, S4A and 5:25). This suggests a maximum quantum of Rs 17,457 crore of outstanding troubled assets. Hence, elevated provisioning might continue for few more quarters before normalisation commences from the second half of FY19. The bank has achieved provision coverage of 66% and accounts transferred to IBC have a provision cover of 68%. Finally, all is not lost due to the asset quality woes. The bank appears to have built an otherwise enviable business which is of interest to any suitor. With the leadership vacuum at the top, the time may be ripe for such a development. Business growth numbers have been strong and the bank appears to be gaining market share, riding on its low-cost liability franchise. At the end of December 2017, credit growth stood at 21% and the bank has 9% share in incremental credit. 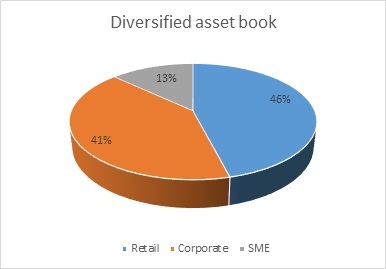 With growth coming from retail, SME as well as corporate, the loan book is well diversified and getting more granular. The bank has identified more profitable segments within retail like microfinance, personal loans, small business banking, loan against property etc that should counter the margin pressure coming from working capital-driven incremental corporate lending. The lending book is getting de-risked and close to 74% corporate exposure is rated at least ‘A’ and 85% of incremental sanctions is rated ‘A’ or above. Nearly 78% of SME exposure is towards working capital. 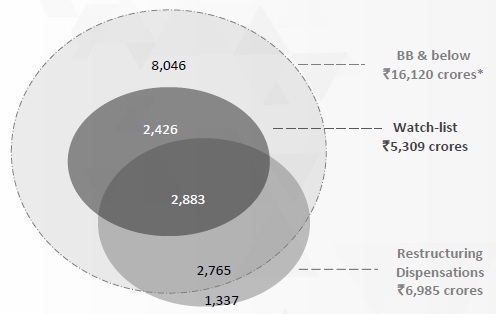 Axis has 8% share of the system’s incremental deposits and the share of low cost (current and savings account or CASA) stands at 49% of total deposits. The bank has built a stable retail-focused deposit base. The share of retail as well as low-cost current and savings account (CASA) is one of the best in the industry. 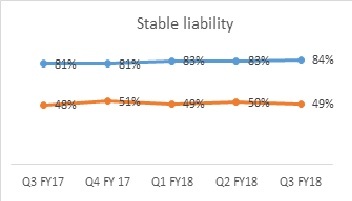 The strength of the liability has resulted in steady reduction in cost of funds and has helped the bank in garnering market share in a market dominated by Marginal Cost of Funds based lending rate (MCLR). Incidentally, the proportion of MCLR linked lending has touched 43% from 4% in June 16. Last but not the least, with the preferential allotment infusing Rs 8,680 crore, the Capital Adequacy Ratio has improved to 18% (Tier I 14.13%) which should take care of growth in the medium term. What should one do with the stock? The stock of Axis has risen 22% from its 52-week low but is off 12% from its one-year high. We do not rule out near-term pressure on the stock owing to higher slippages and asset quality concerns. The leadership vacuum at the top too could act as a short-term dampener until an able successor is named. The stock is trading at FY19 book, an attractive valuation for a potential suitor. The smoother road after the NPA trouble, coupled with higher probability of M&A after the senior management exit makes Axis Bank an ideal candidate that should be accumulated on correction.